This post should be used as a quick reference for anyone needing to do a design and site survey for an indoor arena. This was written for WLAN engineers that already have experience in designing and implementing WiFi. 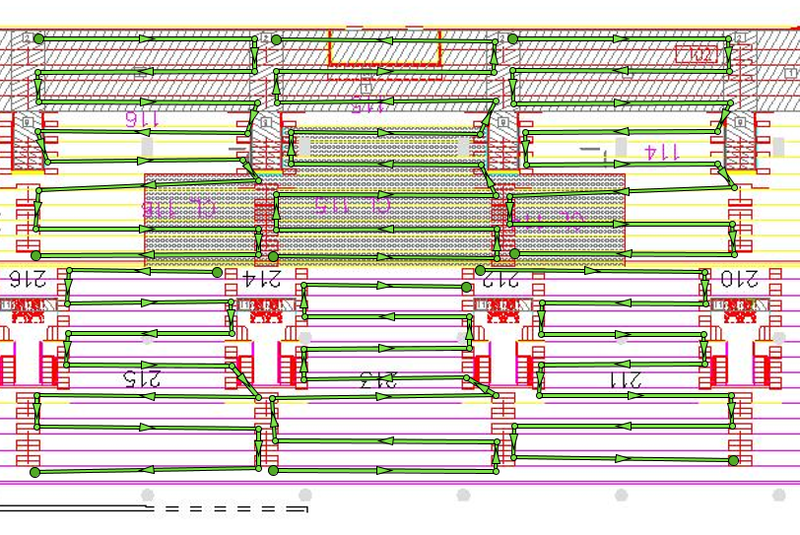 I highly recommend reading through Chuck Lukaszewski’s Validated Reference Designs on Very High Density networks. He goes into much deeper detail than I could ever hope to with this. This is hoping to provide the tools to gather the information you will need. Most of the information in here is meant to be used in conjunction with those documents to develop your design. The order of the first three doesn’t really matter as you do all of them at pretty much the same time on your first initial walk-through. Now, one of these is a great option, one is OK, and the other two are just a bad idea. Let’s take them one by one. 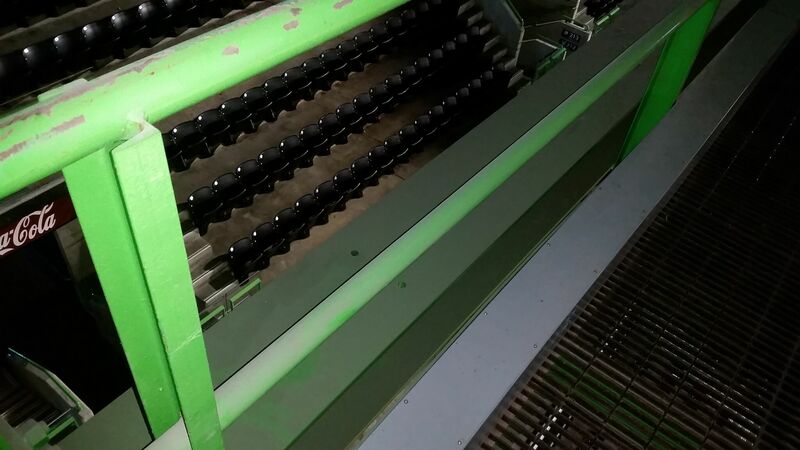 A catwalk or rigging structure suspended in the middle is by far your best option. 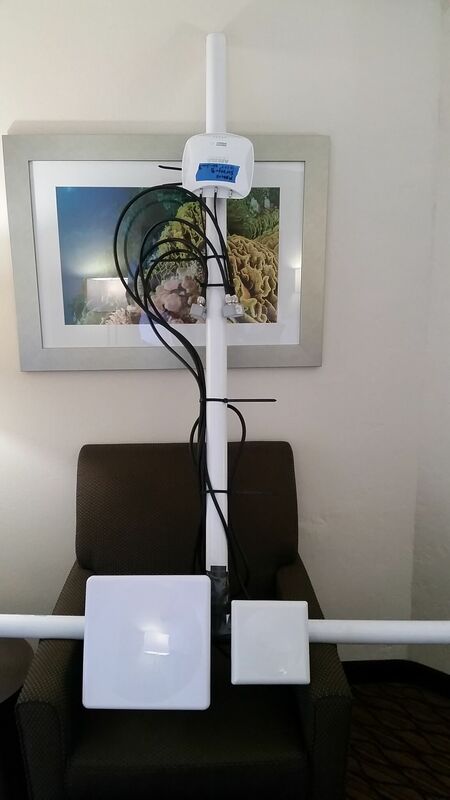 This gives the clients direct line-of-sight (LoS) to the antennas of the AP. It also gives you a chance on achieving spatial reuse in the bowl (which is extremely hard to do and the smaller the bowl, the harder it is) and gives free space between the AP and clients. 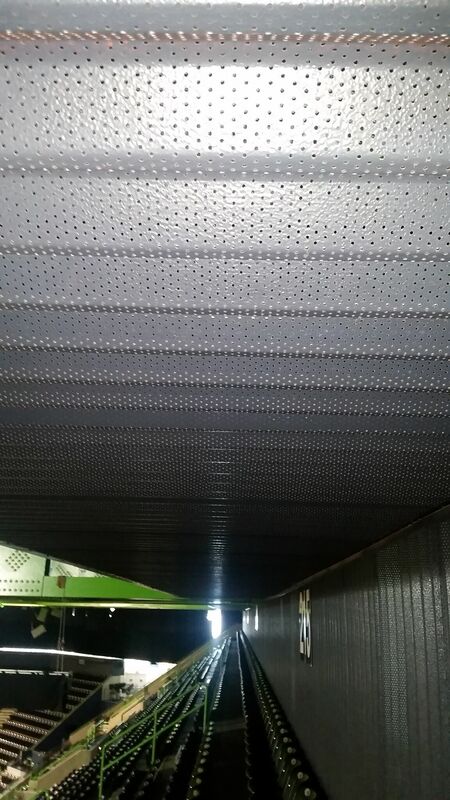 The lighting grid ends up being better than a catwalk because it increases the mounting area for your APs. This means you can have better AP spacing and mount in places that a catwalk would not normally allow. 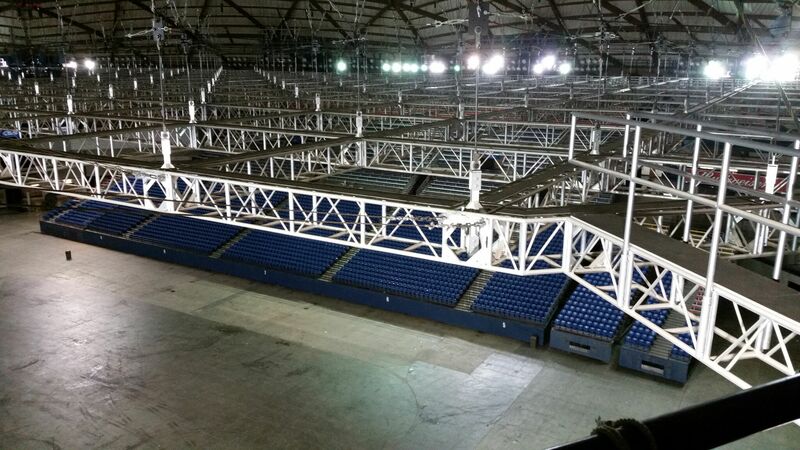 As long as it’s a suspended structure in the middle of the arena that allows you to aim the antennas towards the outer walls instead of the middle – it is a decent option. 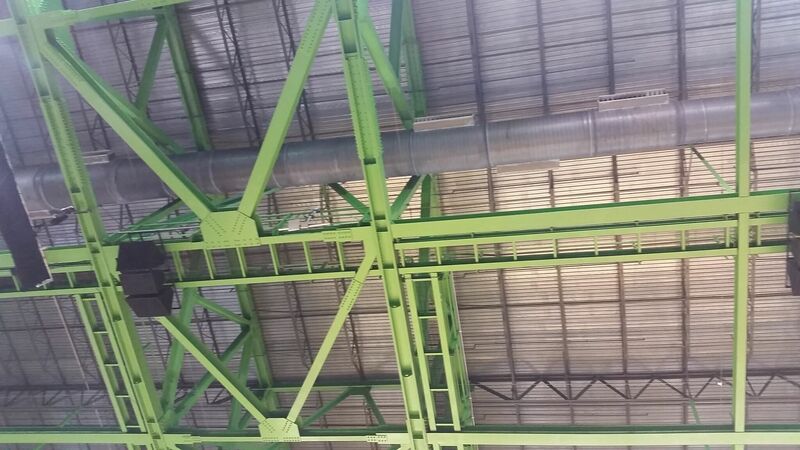 Outer walls and overhangs are a bad idea in an indoor arena. You eliminate any chances you might have had at spatial reuse, while also drastically raising your CCI (Co-Channel Interference). Also, you are forcing clients to transmit behind the user which means it is no longer LoS. You will see some outdoor stadiums with variations of this design and it almost always just due to lack of options. Under the seats is an OK option in an indoor arena. It does keep your cell sizes down due to body attenuation, thus increasing your chances of spatial reuse. However, it does have some drawbacks. One is that your clients no longer have LoS to the antennas, which increases packet retries. It also in inevitably more expensive because you will most likely have to drill through concrete, run conduit, install secure enclosure, etc. This is normally the best option for outdoor arenas since you usually won’t have a permanent structure in the middle to mount to. Update September 2016 – I just wanted to add a quick note about under the seat deployments. They have performed extremely well in outdoor stadiums. The abilities it creates for spatial reuse makes it a front-runner in deployment types and the cost can be justified in a venue the size of a 30k+ outdoor stadium. As for indoor arenas, there has been some testing with this, but there hasn’t been enough evidence that the possibility of a little bit of improvement in spatial reuse in a 20k seat indoor arena would justify the extra cost (normally 2-3x more). Under the concrete is a bad idea. Concrete introduces a much larger amount of attenuation in the 5 GHz band than in 2.4 GHz. This was a popular design 5+ years ago. However, after seeing how the RF behaves and the increasing urgency to get as many clients on the 5 GHz band as possible, it just doesn’t work out. Even with maxing the power on your 5 GHz radios and turning the 2.4 GHz radios down, it’s next to impossible to get any sort of decent band split. You are also now asking your clients to also transmit through people and concrete, increasing your packet retires. Once again, Chuck’s guides are fantastic at explaining how to size your network. For the sake of the survey, we just need to find out the minimum amount of APs we need in the bowl. Now, this will depend on which vendor you are deploying and you need to know the maximum clients their radio can handle. As a rule, you don’t want to have more than 150 clients per radio in the worst (or best…depending on how you choose to look at it) case scenario. So, if I had an arena with a maximum seating capacity of 9,000 people, I would need a minimum of 30 APs if I am deploying dual-radio APs (9,000/300=30). This would mean the network would still work, albeit limping, if every single person in the bowl was connected at the same time. The reason for not overcompensating with APs is that there is a trade-off between AP capacity and CCI/ACI. Once you deploy over 24 APs in the bowl, each additional radio is potential CCI if you are unable to achieve your spatial reuse. So, I always try to deploy the minimum amount of APs that will still work if the max devices possible connected. Now we know we need a minimum of 30 APs in the bowl. 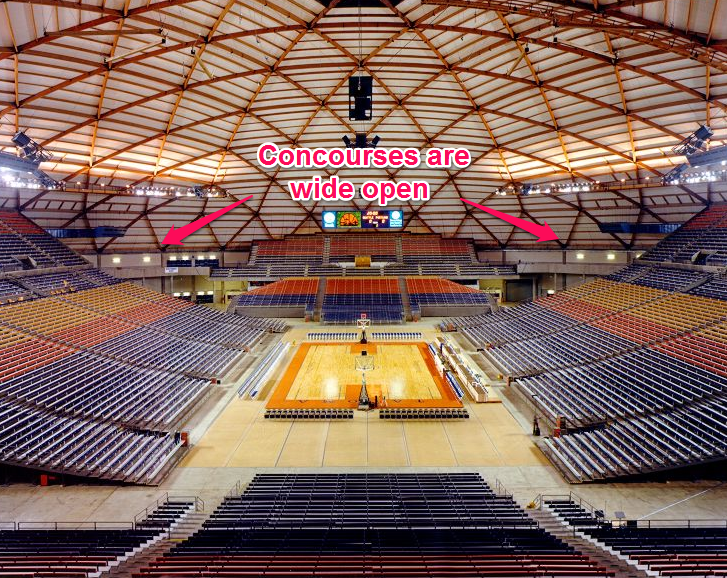 Open concourses – Normally, there is a narrow opening every 20-30′ between the concourse and bowl. This normally allows for good separation between the RF in the concourse and the bowl. Sometimes you will run into arenas that have their concourse or parts of their concourse wide open. 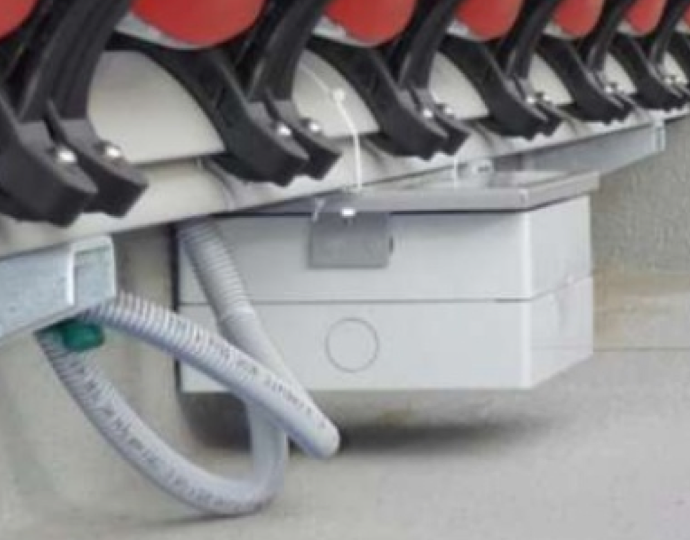 This creates challenges when trying to keep clients in the bowl from connecting to APs meant for the concourse. 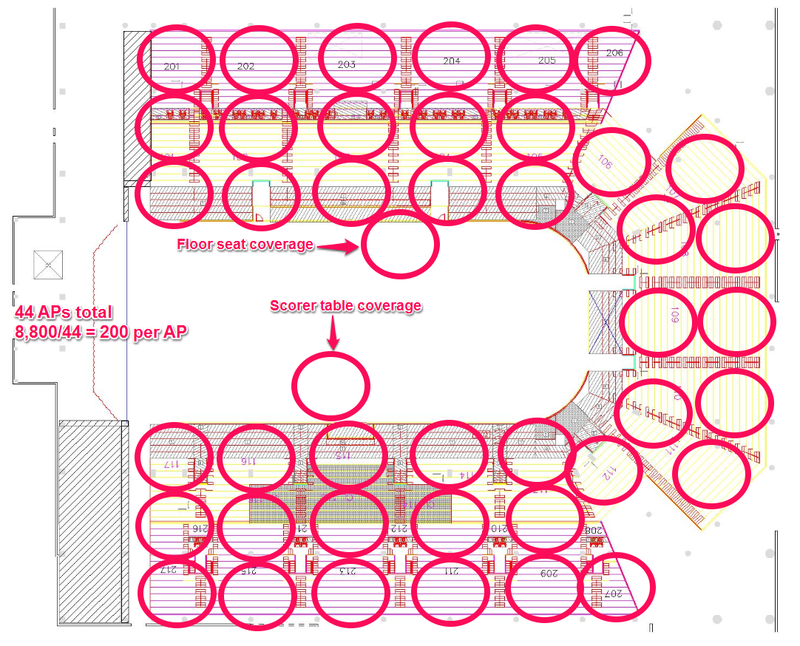 Configurable seating – Be aware of what seating is permanent and what seating is configurable. 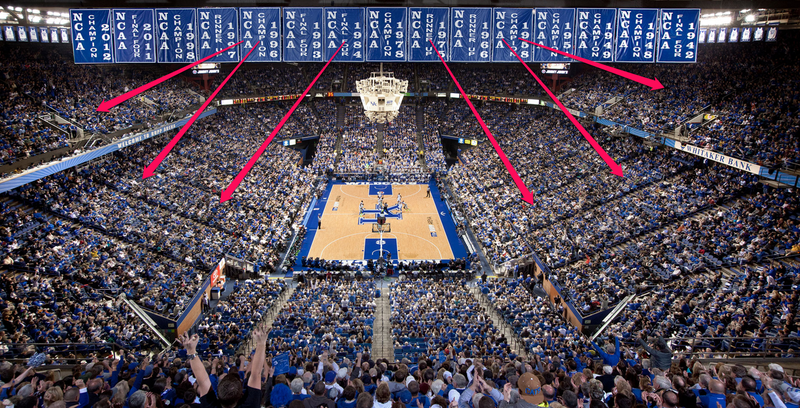 I have been to some arenas that have 25+ seating configurations. There are some that you can design plausible solutions for. However, there are some that simply will do more damage than good. If you can create a solution that doesn’t degrade the system as a whole, then add it to the design. However, doing something like adding several APs and raising your CCI just to cover a single row isn’t a good idea. If you can’t design a solution that will benefit the overall system then note it as a potential problem area in the design. I normally have the same process for every indoor arena. Once I have found a spot I can mount to on the catwalk, I go to a hardware store and get some PVC. I then setup a “T” with an Aruba IAP-224 (soon to be IAP-228), two diplexers (224 has dual band ports), ANT-5314, ANT-2314, RPSMA-M to NM and NM to NM jumpers, 802.3at PoE injector, power cord, and portable battery. 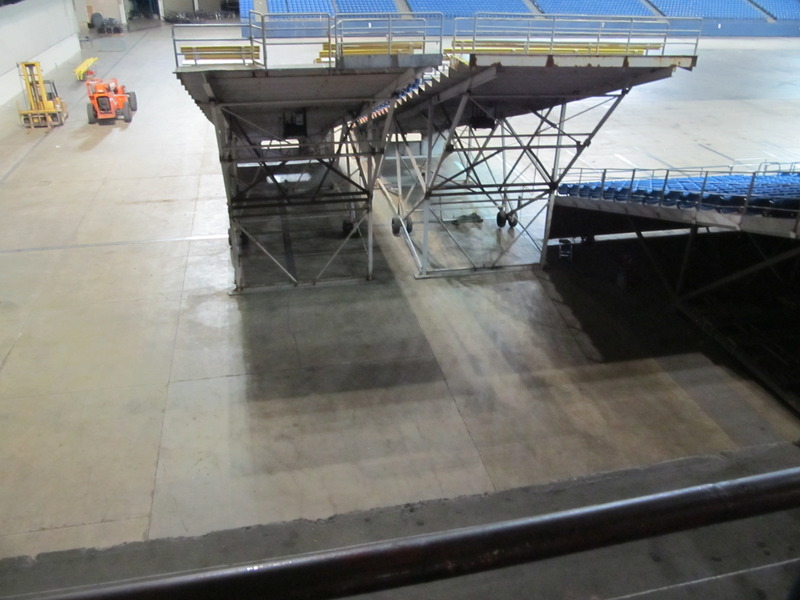 I normally make it around 6′ tall to make sure I have enough room to fasten it to the rails of the catwalk. Now, this is another case of having to know your vendor. I use Aruba IAPs. There are a couple of things you have to do to configure the IAP as a survey AP. You have to configure it to function as a Standalone AP and configure the SSID to work without a wired uplink. I will make a separate blog post on this. 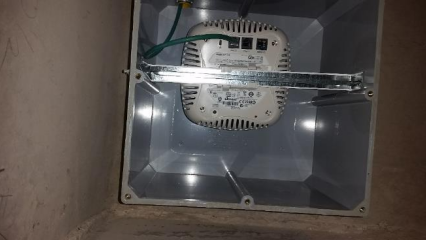 Whatever type of AP you are using, make sure it is configured and tested prior to hanging it. 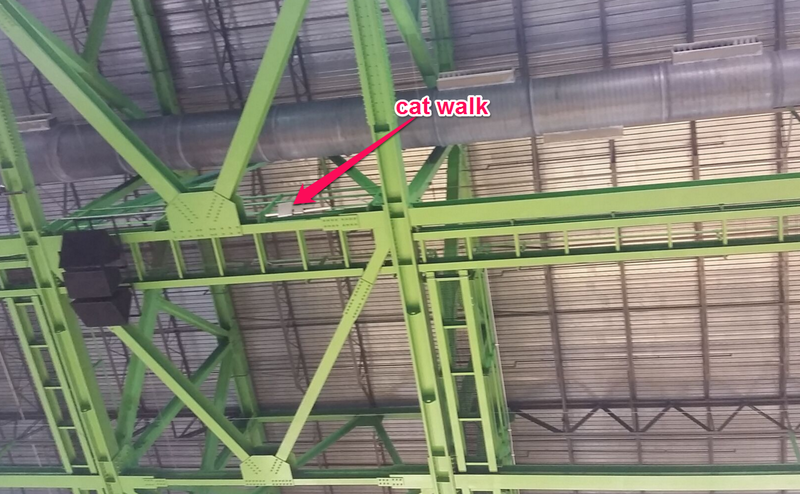 The catwalk is not a fun place to troubleshoot an AP. Now that you have your survey kit built, it is time to hang it. 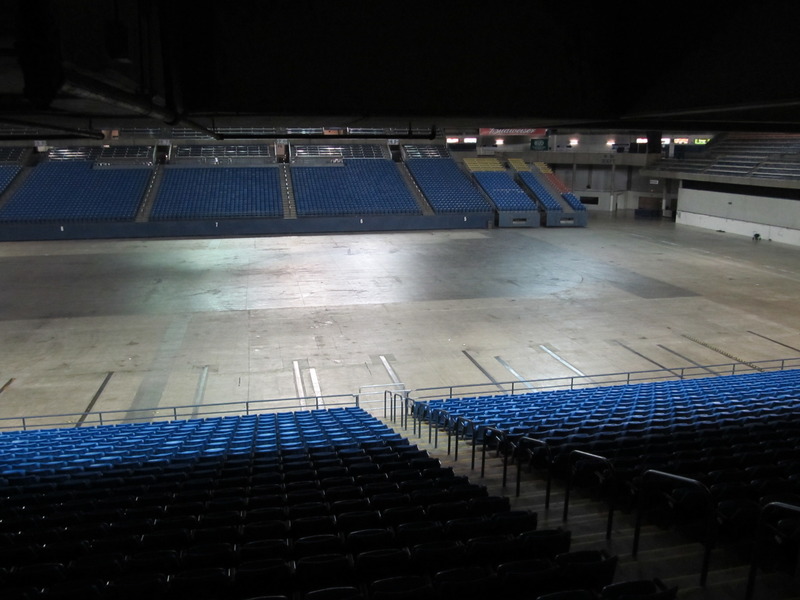 To do this safely, it should be done with two people and during a time with no one on the arena floor. You lower the survey kit over the side where the antennas are ~2′ below the catwalk and fasten it to the rails in at least two places. You also want some sort of secondary fall protection on it separate from the main mounts in case they fail. Also have the second person stay on the catwalk while you survey. When you mount the antennas, make sure they are aimed at the middle of a large section. Also, make sure that section has sections on both sides. When the AP is up, make sure that you have your power and channels statically assigned. I normally remove all channels besides one 5 GHz channel (64) and 2.4 GHz channel (11). I then set my tx power to 6 dBm (4 mW). I rarely end up having an AP deployed above this power level in the bowl. When performing the survey, I survey the main section and all of it’s bordering sections. I stop and save at the end of every section. Once you are finished with the survey, filter the results to show only the survey SSID. 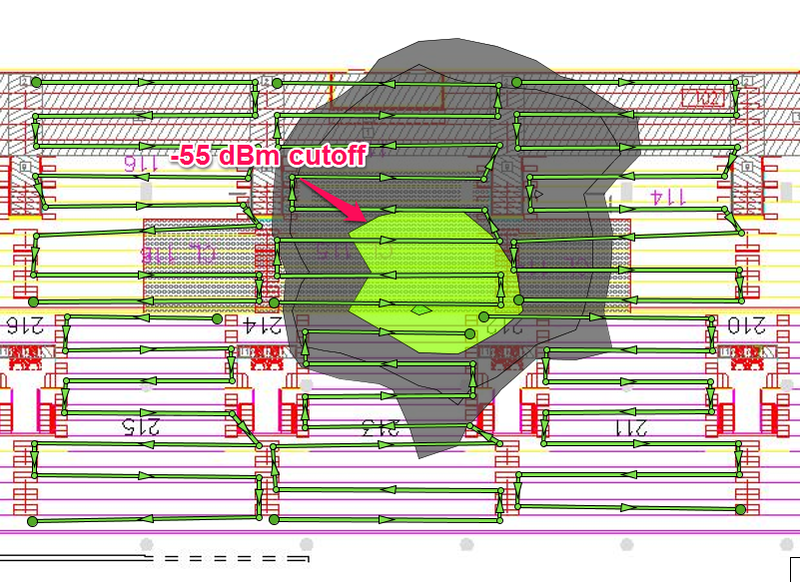 Then bring your cell size down to a -55 dBm cutoff. I recommend planning for -55 dBm cell sizes in the empty stadium because you can normally count on around 10 dBm of attenuation when the arena is full. Now that we have our cell size, we can plan the coverage. This step is pretty simple, you pull up an arena map and create a cell that matches the same coverage as your survey results. Then replicate until you have all of your coverage areas filled in. Make sure you account for scorer’s/judge’s tables and floor seats. Using the 9,000 seat arena example from earlier, I need a minimum of 30 APs. My coverage plan gives me a total of 44 to cover everything I need. If evenly distributed, then each AP will have roughly 200 clients if everyone in the bowl was connected at the same time. Voila! Now we know what kind of APs and antennas we are using in the bowl, where we are mounting, and how many we need. Fantastic! Really good read. I like the detail you put into the article. I can’t wait for the other segments!